Nintendo has confirmed rumors that it will be releasing a new version of the DSi with a bigger screen in Japan. Earlier this week, we reported on rumors that Nintendo was planning on releasing a DSi with a larger screen (4" compared to the current 3.25") in Japan in response to concerns from older gamers. Though the videogame giant initially brushed off the reports as "just speculation," it turns out that - surprise! - they weren't speculation at all. Nintendo officially announced its latest DSi iteration - called the DSi LL - at a Japanese press conference, reports MTV Multiplayer. The DSi LL will actually feature a 4.2" screen for a considerable increase in size, but will keep the same resolution as the current screen. 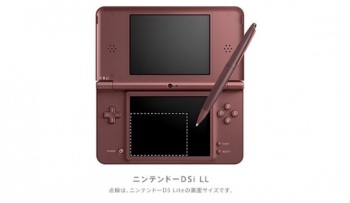 There will also be a special DSi LL stylus, which is larger and shaped more like a pen (seen here to the right). At the moment, the company has no plans to release the LL outside of Japan, where it will launch on November 21 at a price of Â¥20,000 ($220.34, €149.60, Â£133.85) - which is slightly more than the current price of the original DSi at Â¥18900 ($205.25, €138.54, Â£125.28). So unfortunately, while this might be nice to get as a gift for your aging parents to help them in their brain training, you'd have to import (and they probably don't speak Japanese).